Witness the marvellous Icelandic landscape in the most fun way possible: from the back of a dog sled. This tour should not be overlooked by anyone who loves nature, animals and adventure. The tour begins when you are picked up from Reykjavík and driven to Iceland’s South Coast; the journey is short and scenic, and takes your through lava fields, over rivers, and past a sleepy fishing village. Once you reach base camp, you will immediately have the opportunity to greet the dogs before they take you on your adventure. The majority of the pack are Greenland Dogs, but you will also be able to give a scratch to a few Siberian and Alaskan Huskies. Your guide - called a musher - will tell you all about the history of the different breeds and dog-sledding. As soon as you meet the dogs, you will see that they are well looked after and cared for. All of these breeds love the exercise of dog-sledding and have a pack mentality which means they enjoy working with each other for a common goal. You can thus start this tour knowing full well that all involved, human and animal, will have an excellent time. Once you and the dogs are ready, the true adventure will start. After mounting the sled, you will shoot across the breathtaking landscape of wide fields and rolling hills. If you embark on this adventure in summer, or if there is no snow, that will be no hindrance; your musher will simply attach tires to the sled and your tour will continue. You will be rushing through the beautiful Icelandic nature for about an hour. You will have a chance, however, to stop and take photographs and to take in the incredible surroundings. Do not miss this opportunity to witness beautiful Icelandic nature, take an exhilarating ride, and meet a pack of incredible animals. Check availability by choosing a date. Price will update once you select the date and number of participants. Pickup time : 07:30, 08:00, 08:30, 08:45. Pick up time shown in the voucher and booking system. Please be at your pickup location in time for your pick-up time. Should your pickup location be at a bus stop and you need assistance finding it, seek guidance in your Hotel's reception or contact your tour provider directly. Please note that you must weigh 95 kg or less and be physically fit for this tour (BMI lower than 30). It is also not suitable for pregnant women. Pickup starts 2 hours before the dog tour starts. Pick-up time is the time shown in the calendar when booking. The Icelandic weather is unpredictable. Snow cannot be guaranteed. In the case of no snow, the tour will operate on dry land, using a cart with wheels. Had a great trip - the driver who collected us was knowledgable and passionatr about the dogs, the dogs and sled drivers were great. Really enjoyed it. Our guide was very nice and knew a lot about his dogs and dog sleeding. The weather was everything from snowing to windy to sunny all in one tour, typically for Iceland I would say. But the guides were prepared and offered googles as well as additional warm clothes. We done the tour end of March. It was a very great experience and a must do for everyone who loves dogs. The dogs are great and want all your attention, when you are off the cart/sleed. You could pet them nearly as long as they will pull you through the beautiful landscape. It was absolutely incredible! Such an amazing experience and one I would definately recommend. 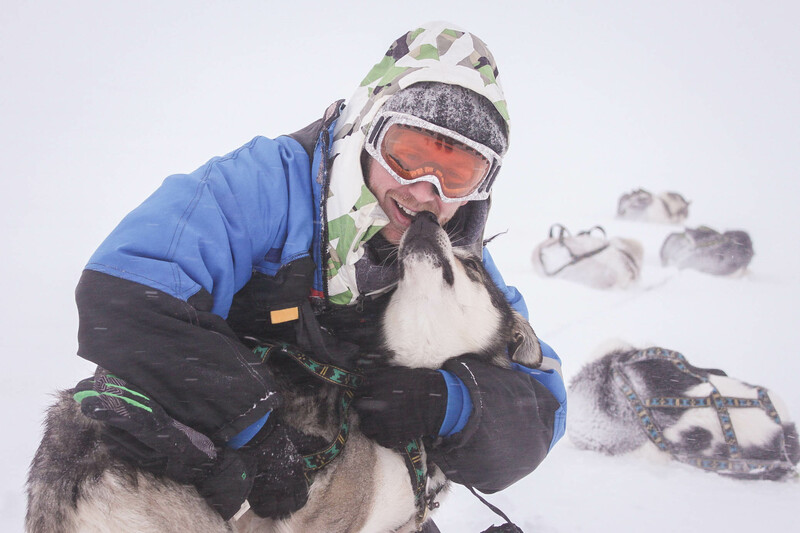 The dogs were very friendly along with the sled operators who were very knowledgeable. I would do it again and again! We had a great time with this dog-sledding experience. Kristine was very friendly and knowledgeable. Our sled operator was equally fantastic. The dogs are so sweet and affectionate. Where else can you do something like this? I strongly recommend this tour if you have interest in this sort of thing. It is well worth the money. We absolutely loved this tour. We had such a fun experience. The dogs were so friendly and we loved meeting the variety of breeds. Kristine (our driver to location) was very knowledgeable and told us about all the breeds, their diet, and how they raise the pups. It is a very personal experience, because she knew all their names. Our pickup and dropoff were punctual. The drive to location was perfect, including a stop for bathroom break beforehand. Our musher (who was from Israel) was awesome! He was passionate about his work and training the dogs. We enjoyed taking turns mushing and rotating seats in the sled so that everyone shared in the unique experience. Our musher took amazing pictures of us that we will treasure forever. We have bragged about this tour to all our friends and family. We would DEFINITELY recommend this tour. It was the best part of our trip to Iceland. Love the dogs and our tour guide Christine and Ithai! Highlight of our trip (and the entire trip was amazing!). We got the transfer from Reykjavik - so were lucky enough to get a preview of what to expect from our guide Christine, who was so willing to answer any questions any of us had about the dogs or Iceland in general. The scene was perfect, the dogs adorable, the staff passionate and great humans. A must do for dog lovers heading to Iceland! Absolutely loved this very special experience! On the ride to the mountain, our guide Christine spoke of each dog by name so lovingly it were as if she were speaking about her own grandchildren. The landscape was beautiful, and the ride was easy, safe and fun. We were able to take lots of great photos, and each of us even got a turn to mush! It was pure joy to connect with the dogs, and we loved that we had lots of cuddle time before and after the ride! The entire staff was great, and it was very clear that dogs are happy, well loved, and well cared for. Worth every penny! What a wonderful experience! We sadly didn't get the snow but it was still very magical to take a ride with the dogs. Clearly they are all so well looked after and you can see how loved each and every dog is. We even got to meet the puppies! Highly recommend, the snow would really just add to this experience.